Find out how Employee Advocacy can make you a better salesperson and help your sales team become a formidable asset to your brand. The world of sales is ever-changing. It wasn’t long ago that cold-calls were king and email lists ruled the waves online. With the wheels of evolution constantly revolving, the need for B2B and even B2C sales people to seek advantage wherever they can is ever prominent. The beauty about modern sales is that there are now so many tools available for optimising your strategy and the revolution has in some ways taken us full circle. One of the longest serving requirements, ‘relationship building’, has again entered centre stage. Thanks to social media, sales people can now build more relationships easily and offer a personalised experience to their customers on a larger scale. Employee Advocacy and social selling give this process a huge boost, in your personal profile and your ability to forge connections. Check out our 7 awesome stats that link Employee Advocacy to better sales! In case you’re unsure of what it is, employee advocacy is about sharing company content and better engaging with your brand to improve your chance of converting leads into customers. How? Well the idea is that a lot of salespeople don’t fully utilise their own social channels, despite a huge proportion of the buyer journey being spent on online research. This is especially troubling for B2B salespeople because the chances are that the buyer is also researching you personally, so what they see on your public social channels is pretty important! If they visit your LinkedIn page for example and they see that you are passionate about your brand and an expert in your field, they’re more likely to find value in forming a relationship with you that could eventually turn into a sale. It works the other way too but we’ll get into that in more detail shortly. We touched on your personal brand just now so let’s dive deeper into that pool of thought. Believe it or not, we’re all representing our own brand. Even if we’re meant to be representing our company, first and foremost we’re representing ourselves as people. Imagine you’re behind the help desk or at a trade show for work, sure there are rules you need to follow stipulated by your employer but the rules you follow first and foremost are basically human; smile, be polite, be welcoming, listen attentively, respond positively, etc. In the same way that customers prefer to approach whoever appears to be the most helpful employee in a store, they want the same experience online too. That’s why a smart looking profile that’s full of relevant content to your field or job is so important to give people the impression that “this guy/gal can help me with my need”. Employee Advocacy will first help you establish and then affirm that link between you and your company. It not only shows that you’re passionate about your brand but also that you’re an expert in your field. Who would you rather approach in the retail store, the employee trying to hide in the back of the store or the one out in the aisles offering his/her product knowledge to other customers? Think of how much extensive research has been made available on human and consumer behaviour, how many stats there are that can recommend with absolute certainty the “people behave in ‘X’ way because of ‘Y’’. But if I asked you who knows your favourite customer or your friend’s needs better, you or the analysts around the world, who would you say? Hopefully you said you! Why? Communication. Communication is the key resource for really knowing about a person and especially their needs. It doesn’t necessarily have to be through conversation either, listening plays a huge, if not the biggest, part. Truly engaged social sellers don’t just project, they also listen. Do your own research, follow your leads online, follow specific hashtags related to your field or product and focus on listening to what they are saying. You might be surprised by what you learn about your leads or ideal customers that you didn’t know before, it may even go completely against your initial assumptions. If you can personalise the customer’s experience based on their own specific needs or behaviour, that will always trump any broad assumptions. As we’ve already said, most of the buyer’s time is spent in the research phase and a lot of this is done online. In fact, business buyers spend 56% of the sales cycle searching for and engaging with content according to Nielsen. That’s great for salespeople who are online right? Yes definitely, I’m doing my best to avoid any ‘fish in a barrell’ analogies, but at a loss for a better option, these fish are willingly jumping into your online social barrel to fulfil their need. But is that enough for you? No. There are millions of other salespeople (78%) just like you in that same barrel, whether you favour LinkedIn, Twitter or any other channel for social selling. If you’ve simply set up your profile and left it, that’s as good as a line without a hook. Your hook can come from the content you share, but what about the bait? For really good bait you’ll need to take initiative. OK enough of the fish analogies. The point is that it’s not enough to simply be visible online, you need to be valuable. Taking the initiative and demonstrating truly great value comes from three steps on your part. Firstly, to listen as we’ve discussed in How #2, secondly to respond and lastly to even be able to predict. Like word of mouth marketing or being an expert source of information aren’t new tricks, responding to queries isn’t either. However on social media, you can better refine this process and wow customers before they’ve even entered your store or answered your sales call. Responding comes from listening and it’s probably the easiest and most efficient way of reaching out and making a connection. It can be as simple as answering a question that someone has asked their followers by sharing a specific piece of content with them – like responding on Twitter for example, “Hey @MrFace, I saw you ask for recommendations for a local web developer. Here’s an article my company wrote on hiring freelancers…”. Maybe, your marketing team has given you a list of people who have already offered their information in exchange for answers to their needs, why not learn more about them on social media before picking up the phone. 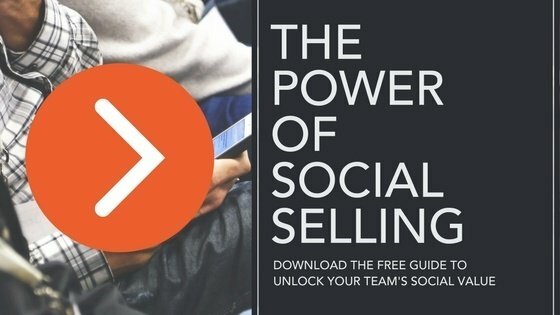 Through social selling, you do all of this out in the open on your channels, where other potential customers who may have the same need will see how valuable you can be. Prediction is the next step, you’ll soon become an expert in your network’s behaviours and needs and even their future needs. As we’ve said, you can learn more about someone through an hour’s worth of communication than you could through even years of scientific research. This gives you even more options for refining the content that you share and even how you reach out to build connections with potential new customers. You might be able to recommend specific content topics to your marketing team by providing them with better information – marketers love new and real data! You might even build up the confidence to have a go at creating content yourself, thus adding another string to your personal brand. Employee Advocacy for sales benefits everyone; you, your colleagues and especially your customers. You might immediately see it as another tactic like cold-calling or email marketing but it’s actually bigger and more encompassing than those things. In essence, it gives you the perfect platform to not just demonstrate your value, but also to provide it and your customers will thank you for the experience!